After living in Korea for more than 3 years we finally had a good reason to visit Japan. We were invited to attend the wedding ceremony of friends who lived in Seoul but moved to Osaka this spring. Now we could compare the land of the morning calm (Korea) with the land of the rising sun (Japan). 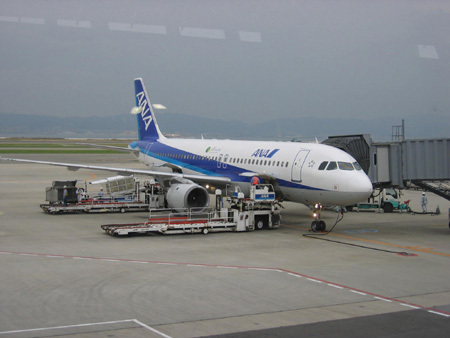 After a quiet flight we arrived at Kansai International airport. As you can see we look a little tired. 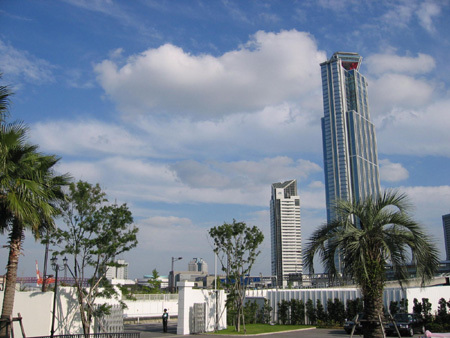 Although flying from Incheon airport to Kansai airport takes less than 1 1/2 hours it took around 8 hours from our house to the New Otani hotel because both airports are located outside Seoul and Osaka. 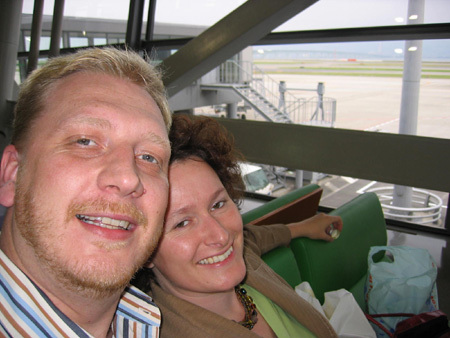 Our first steps on Japanese soil. 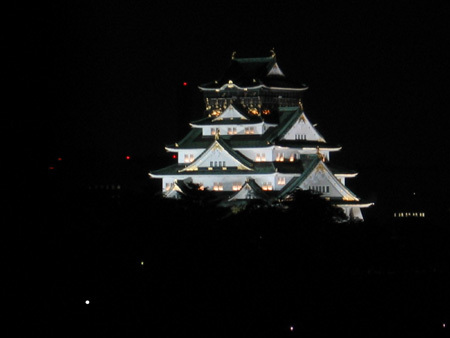 We put a picture on our weblog of the 'Osaka castle'. We knew that our hotel was located close to this beautiful castle but we did not know that our friends arranged a room with 'castle view'. Time to start our exploration of Osaka and Kyoto. Friday evening, a full Saturday and Monday morning (Sunday is wedding day). 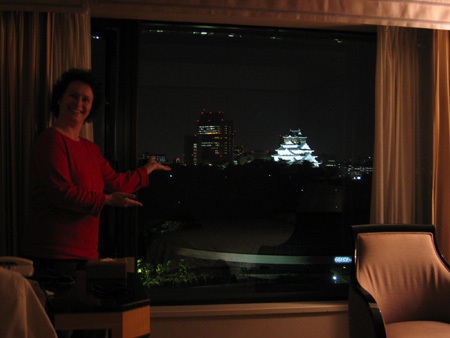 View on Osaka castle from our hotel room. Zooming in on Osaka castle. 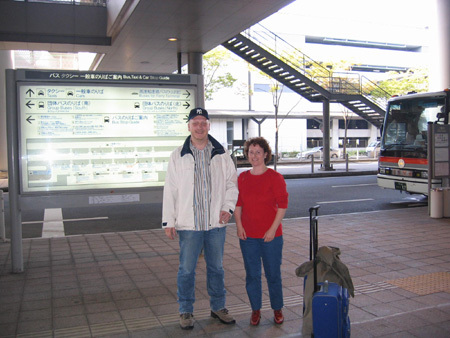 The next morning we went to Kyobashi Station to figure out how to get a train to Kyoto. People already told us about the amazing Japanese transportation system. It is truly amazing, a maze of trains, subways, busses and everything is departing exactly according to schedule. How nice to see employees bowing every time upon entering or leaving a wagon. We heard stories about Japanese workers taking pride in their job and you can see they do. They really are proud to work for their 'own' company. Anyhow, on our way from the hotel to Kyobashi train station we noticed that everything in Japan looks clean and organized. If the Koreans are the Italians of North East Asia, the Japanese are for sure the Germans in this region. We also noticed another difference. If a Korean businessman wants entertainment he will go to a 'business club'. Cheap entertainment with whiskey and women. In Japan they have another way of entertaining businessman. They lure them inside clubs with pictures of girls dressed up as nurses or stewardesses. 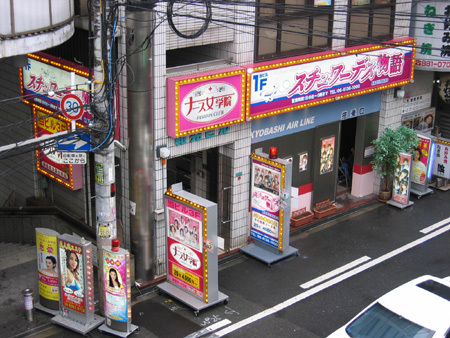 If you look good at this picture you see a bunch of Japanese 'nurses' on the advertisment signs outside. Furthermore Kyobashi airlines is not an airline company as we know. Funny!! Nurses and stewardesses, come in and look around. It only takes a couple of minutes to figure out how the train and subway system works in Japan. It takes a little bit more time to discover how to get a ticket out of a coin operated machine. One important thing to remember, try to find rapid express trains. If you just take a train to your destination you might stop at every station. The colours will show you which train is an express train and which train is not. We took a good train to Kyoto. In the Lonely Planet Guide they mention Kyoto together with Tokio as the two cities you definitely must visit if you go to Japan. 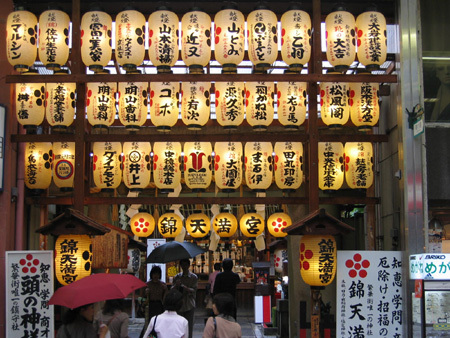 We just have to be satisfied with Kyoto, there is no time to visit both cities in one day. Anyhow, if you have to believe the Lonely Planet Guide the minimum time you should spend in Kyoto is two days to just 'scratch' the surface of the city. We will try to scratch it in one rainy day. Upon arrival in Kyoto rain was pooring down like in the summer season. We immediately started to visit temples and shrines. Because Kyoto did not suffer a lot of damage during the second world war most temples and shrines were preserved very well. They have 17!! world heritage sites and a lot of these beautiful temples are located close to each other. Therefore we managed to see 4 or 5 temples and shrines in just a couple of hours. Enough temple surface scratching for us. 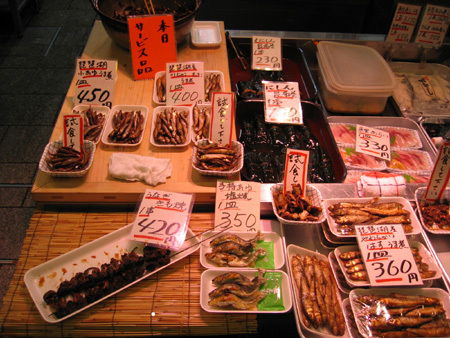 We decided to go to the Nishiki Koji Market. It is a great market to visit on a rainy day because it is covered. What you can find in an alley in Kyoto. 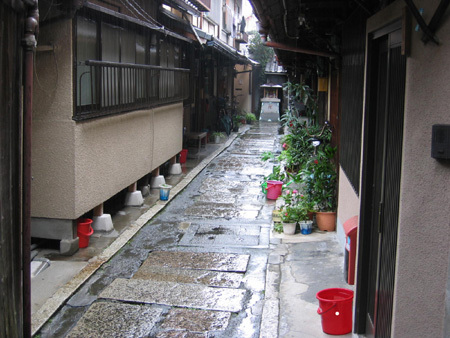 Another alley, fire prevention: red baskets filled with water everywhere. Just visit this market if it rains. The displayed food is very nice to see. 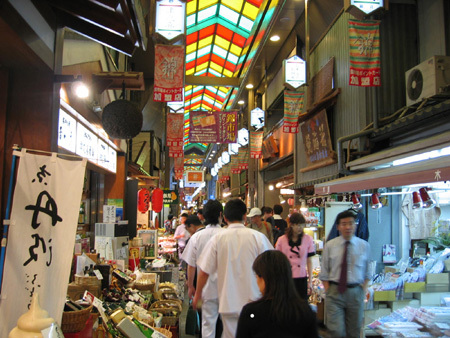 The vendors are friendly so you can easily spend several hours at Nishiki Koji Market. In the past we always heard stories about Japan being so expensive. But the Euro is strong compared to the Yen, it is just a little bit more expensive than Seoul or Europe. You can have a good lunch for anything between 500 and 1000 Yen (calculate 8 Euro's to 1000 Yen to be on the safe side). You can taste samples of everything. 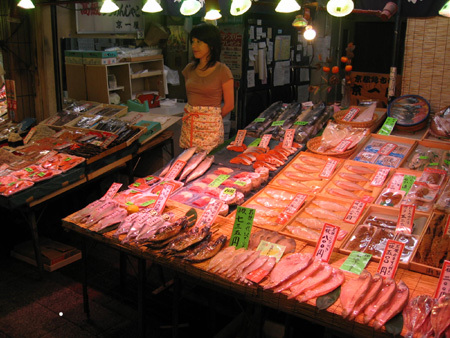 Displaying fish at the market. Somewhere in the middle of the market we found a Buddhist temple. 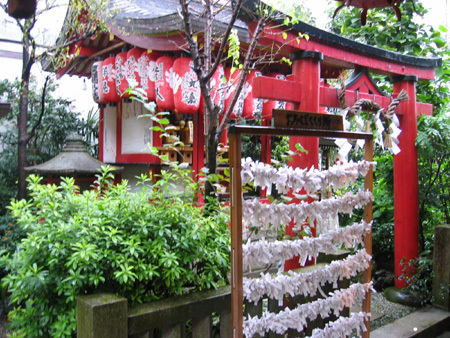 Buddhism is widely spread in Japan and this temple was visited a lot by Japanese people. Every couple of minutes people donated money into a wooden box and pulled the string of a big bell. It sounds like a divine cash register. The white lanterns in front of the temple are very stylish but we are not sure if it has anything to do with the temple. The white papers contain written wishes and prayers. Korean youth looks more conservative than Japanese. Maybe it is just a temporarily thing. Before becoming part of a society which is like a social boobytrap you only have one opportunity to express yourself. If you are young you can be a 'rebel'. We asked these friendly girls if we could take a picture and they even enjoyed it. 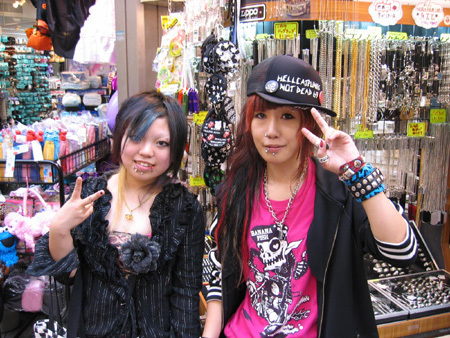 We saw many boys and girls dressed alternative in Japan. In Korea we have seen maybe two or three boys or girls like this in more than 3 years. Cap: hellcatpunks not dead 69, hmmm. In one of the restaurants we tried almost every dish is prepared with fish. You probably know that sushi is prepared with raw fish, but there are many more ways to put raw fish into your meal. 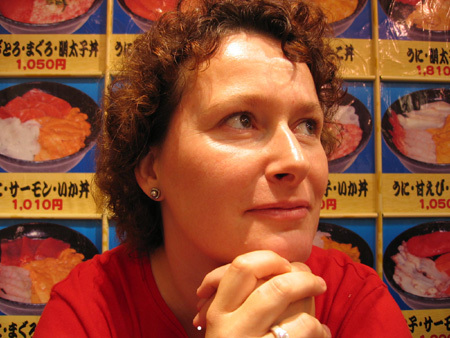 Christina thinks of a way to order something without raw fish. It is impossible to see everything Kyoto has to offer in one day. 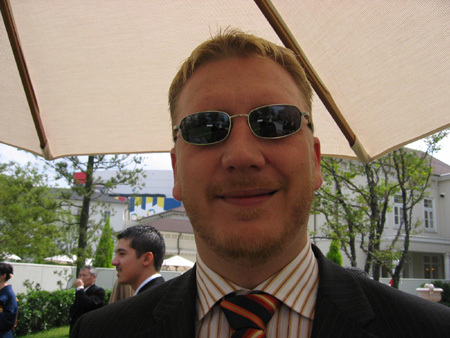 But we think it is possible to get a good first impression in one day if you like to walk a lot. 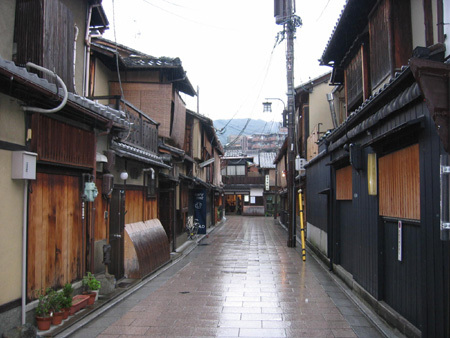 On our way back we walked through more alleys and we are sure we scratched the surface of Kyoto. On our way back to the train station we even saw a women dressed in tradidional kimono walking in one of the old streets of Kyoto. What more to expect from Japan? Our train back to Osaka had better seats than the train to Kyoto. Because of all the walking we both were sleepy. We woke up just in time to get of the train at the right station. Upon arrival It was almost evening in Osaka so we first went to a small local bar / restaurant to have a drink. Unfortunately we forgot to make pictures, just imagine a wooden interior, sake bottles everywhere and a bar which also functions as food display (dead fish alert). This bar was a genuine Japanese sake/food bar. We were the only foreigners around and the other Japanes guests were very friendly. They tried to communicate with us although they only talked a few English words. We had to try the warm sake, fish, and other dishes they were eating. We were impressed by their friendly an polite approach towards us in this bar. After several sake's we unfortunately had to go. We only have one Saturday evening in Osaka so we planned to see as much as possible. We walked through the streets for several hours and we bought snacks from street vendors everywhere just to experience Japanese food as much as possible. After a while we went into a supermarket. We wanted to see see the difference between Korean and Japanese supermarkets. In short, more variety and choice with prices around 10 procent higher than Seoul. Not to our surprise we found these digital price displays. If there is one place in the world where you can expect something to be digital it is Japan. 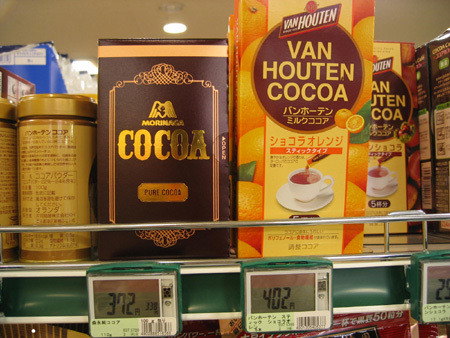 Van Houten, Japanese people know good chocolate (Dutch). When we left the supermarket we heard people screaming 'hallooooo!'. Imagine, we walk in a street in Osaka and our friends (who will marry) walk in the same street because it is close to their house. We did not even had any idea where they were living! They had to look for a taxi because they did not manage to order a taxi by telephone although they both speak perfect Japanese. Because it was raining taxi drivers did not want to go to their house to pick up luggage. They were also going to stay in the New Otani hotel the night before their wedding and they wanted their luggage to be transported. We walked with them to a taxi stand and wished them a good night rest before this important day. We continued our investigation of bars, shopping malls and convenience stores for a while before going back to the hotel. In short, it was a busy day but very well spend. The next morning we woke up early. The wedding ceremony started at 10.00 am. The first part was very special, a Buddhist ceremonial wedding. The bride was wearing a beautiful Kimono and the chanting during this wedding ceremony was impressive. After the ceremony we went to a wedding hall. This is something you can also find in Korea. It is a place for your reception. Maybe wedding hall is not exactly the right word for that place. 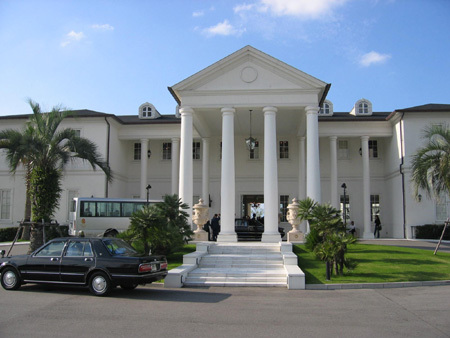 It looked like an English mansion but with a neo-roman entrance. Close to the wedding hall and Kansai Int. Airport, WTC Osaka. After the reception we went back to our hotel to relax a little bit before the evening party. Christina went outside to investigate the source of some loud pop music in front of the hotel. 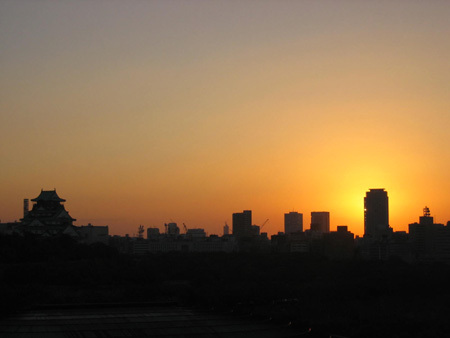 I watched the sun going down in the land of the rising sun. On the left you can see the Osaka castle, on the right Osaka centre with all the sky-scrapers. Monday morning. Strange because it is now Monday evening while writing this story. Anyhow, we wanted to use this opportunity to sleep in. Sleeping in means 09.00 am if you have children but it was very nice. We did not visit Osaka castle although we first planned to do so. Watching it 3 nights from our hotelroom was good enough, especially because we heard that only the outside looks authentical. On the inside it is a modern museum displaying the history of Osaka, the castle and Toyotomi Hideyoshi, the guy who unified all of Japan in the late 16th century. We can always read books about this part of history later on, cultural barbarism sometimes feels just fine. Especially when you can sleep a little bit longer. We took a taxi to Osaka central station because this is where you can find a lot of shopping malls. 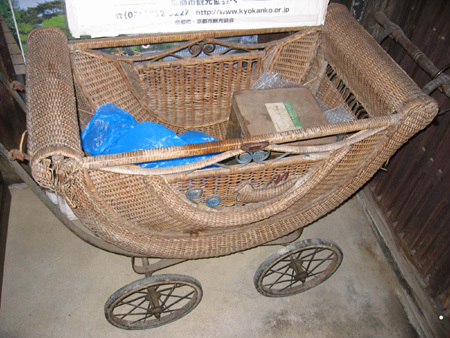 We needed to buy some gifts for Lilly, Yde and Vibeke. After buying our presents we rushed to the train station to go back to the airport. 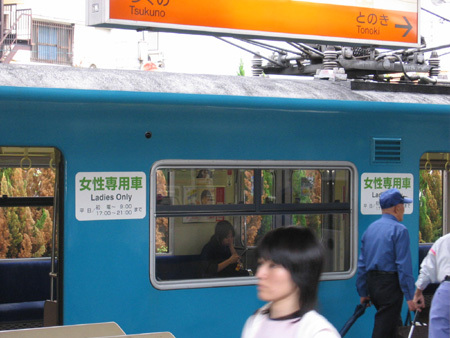 Ladies only train, but not a mens only train? Discriminating!! Not much more to tell, just our plane. A small one. By the way, the airport has a monorail train to cover around 200 meters. Nice for lazy people. ANA: blabla Nippon Airways. Lunch/Diner: rice crackers.